For the past few days Tim Poulter of ComputaCare, based here in Colesbourne, and I have been busy preparing the new website for Colesbourne Park. It has just been launched, enabling us to present both it and the new snowdrop availability list together. We like it - see what you think! For the past couple of weeks I've been enjoying a generously-sized pot of Erica gracilis, one of the South African Cape heaths, which I bought for the princely sum of £2.99 from our greengrocer in Cirencester. It's about 30 cm high and wide, and is absolutely smothered by thousands of small richly-coloured flowers. In the batch were white-flowered plants too, and I suspect this is a selected clone with particularly reddish-hued flowers as the species is usually a slightly duller purplish pink. As a wild plant Erica gracilis is found at lower elevations between Swellendam and Humansdorp on the Garden Route east of Cape Town, and is not particularly abundant, it seems. As the authors of Ericas of Southern Africa (Schumann et al. 1992) remark, however, 'it is nowadays grown more prolifically under artificial conditions in Europe than it it occurs naturally in South Africa.' But the odd thing is that this heath is the only one of the almost 700 South African species to have become an item of mass cultivation in Europe - and it is an important item. I've always understood that the cultivation of Erica gracilis is a German speciality, and an internet search reveals that this does indeed sem to be the case. Several large German nurseries specialise in heathers, and each has a range of different Erica gracilis cultivars. Among them are Eurofleurs, Gartenbau Holz, and Silber Gartenbau. The plant (actually there are several individuals in the pot) I bought was grown in a clay pot - a great rarity in itself these days - that looks as if it had been plunged in sand, and was potted in a very light compost of peat and silver sand. This all suggests that the cultivation of E. gracilis is a very specialist skill, which makes it all the more a pity that it is sold mostly as a short-lived throw-away plant. I suspect that most get planted in the garden, in fact, where they must have a very short life: the rest probably dry up quickly in a centrally-heated home. Erica gracilis, as bought in a dirty clay pot. I fear the same fate will befall my plant, but it doews make me think, why should this species be so successful in cultivation 9when conditions are right)? I don't know, but it seems that in the past Cape heaths were rather popular in cultivation and that we have lost the knack - or tradition - of growing them. It seems to me that here is a frontier to be rediscovered. Below are a few representatives of the diversity of Cape Erica, photographed at Kirstenbosch in September 2010. Erica 'Glengold' - a truly showy hybrid cultivar. This evening saw the preview of an exhibition of botanical art by Christine Battle, held at The Backyard Gallery, in Tetbury, Gloucestershire. This is her first solo exhibition and is all the more remarkable for the fact that she only started painting plants in 2006. Her progress has been rapid! I first met Christine when, while researching New Trees, I visited her remarkable young arboretum at Congrove in South Gloucestershire (see my post of 20 March 2011 for more on this). Shortly afterwards she asked me for advice on her portfolio for completing the Diploma in Botanical Illustration from the English Gardening School, and said she'd like to do a series of paintings of rare trees. In the end she chose a selection of unusual species from New Trees, and prepared plates of them as though they would appear in the book. This series won an RHS Gold Medal when exhibited at the Malvern Flower Show last year, and the plate of Eucalyptus leucoxylon subsp. megalocarpa (above) was awarded an Honourable Mention in the show of the American Society of Botanical Artists show that has just finished in New York. Christine Battle (L) and Harriet Tupper, Chairman-Designate of the International Dendrology Society, with some of Christine's New Trees paintings. The Backyard Gallery, home-base of Ken and Elisabeth Hancock, has done Christine's work proud in this exhibition, hanging her originals and prints very crisply against red walls, where they look stunning: if passing through Tetbury between now and 8 December it is well worth a visit. More images of Christine's art can be found on her website. Preview at The Backyard Gallery, Tetbury, fortified by the remarkably good Jenkyn Place sparkling wine. Happy Thanksgiving to all my American friends, followers and readers. The remarkably mild autumn has had several unusual horticultural consequences - the prolonged blooming of many summer plants being one, and the early flowering of several winter ones being another, though less desirable. One of the positive results has been the development of abundant seed on Nerine bowdenii in the open garden, which usually doesn't happen as the flowers or incipient fruits are destroyed by frost. I've harvested seed from five distinct clones today and will sow it tomorrow in a light and gritty compost. The seedlings should emerge in spring and will then take several years to reach flowering size - at which point it will be possible to evaluate how they differ from their mothers. The fleshy seeds of Nerine bowdenii vary in colour between clones. These are on an unnamed clone derived from Stanley Smee. Tony Avent surveys a sumptuous new Colocasia in his trial ground at Plant Delights Nursery, North Carolina, September 2011. ﻿ Opening my mailbox this morning I found a message from that indefatigable horticultural news-hound, Bobby Ward of Raleigh, North Carolina, alerting me to an article in today's Sunday Telegraph, available online. It's by Jenny Andrews, and is entitled New Plants: An American revolution. I think it's rather an important article, really emphasising how many important new garden selections are coming from the powerhouse that is modern American commercial horticulture, and it's well worth reading. The majority of American home gardens may still be very dull and uninteresting, but over the past few years I have come to find American horticulture extremely exciting. Part of this is, no doubt, seeing a range of plants that we can't grow easily or well thriving in a different climate, but the activities of the best gardeners, whether it is with innovative landscaping and planting combinations, or in the nursery, is invigorating and inspiring. I've been fortunate enough to meet and get to know some of those involved in this revolution, notably Tony Avent of Plant Delights Nursery, where he is experimenting with a vast range of new material, both wild and highly bred, and is encouraging others to do the same. A visit there, such as I made in September, is mind-blowing. ×Gordlinia grandiflora, a hybrid between Franklinia alatamaha and Gordonia lasianthus. Further west in North Carolina is another hotbed of activity - the North Carolina State University's Mountain Horticultural Crops Research and Extension Center, near Asheville, where Dr Tom Ranney leads a team investigating new potential in a range of woody plant genera, in search of good garden plants. One of his team's notable successes was breeding the first pink-flowered Hydrangea arborescens, sold as Invincibelle Spirit, and a major breakthrough in this very important landscaping plant in North America. Now the race is on to develop further pink cultivars with better habit and richer colour: in September Tom showed me a whole field of seedlings under assessment, although all their flowers had been removed to prevent snooping eyes getting a preview at an open day for viewing other crops. As Jenny Andrews explains in her article, there is potentially considerable money in a successful cultivar finding widespread usage, so such precautions are sadly necessary. Hydrangea arborescens Invincibelle Spirit, at NCSU Mountain Horticultural Crops Research Center. The autumn clear-up of the cottage garden has started in earnest, with a good session this afternoon cutting down the standing growth of the perennials. It's a very satisfactory process, although it does reveal the multitude of weeds growing below them and some areas are quite mossy: a good mulch is needed. In the process I'm also removing plants that don't justify their space for whatever reason. In a small garden there's no space to keep passengers: everything must justify its existence in some way and any garden needs to be constantly refreshed with new plants and new ideas. Today's casualties were a very dull and unpleasantly sticky Salvia, a Stachys whose name I've also forgotten, being a very unmemorable plant (though I have a lurking suspicion that it's rather unusual), and Clematis heracleifolia 'Wyevale', a leafy brute that certainly doesn't warrant houseroom here. In my sights are a big bush of Sambucus 'Black Lace' - a lovely plant but in the wrong place, and a clump of Rodgersia pinnata that is not 'Superba', and there are a lot of things that need 'lessening' as I go. It's good to get it done at this time of year, as its's all too easy to forget in the rush of spring and then you're left with the same old things taking up even more room than before. ﻿Last year I reported on the unwontedly early blooming of Galanthus plicatus subsp. byzantinus 'Three Ships', on 18 November. This year they are even earlier, presumably 'popping' over the weekend, perhaps in Sunday's lovely sunshine. These are part of the Colesbourne Park clump, in a cosy south-facing spot, but they are also at a similar stage here in the cottage garden, facing north and under old hellebore leaves. (They are no longer under old hellebore leaves.) As the weather forecast promised, today is also bright and sunny, but much cooler - though there is no indication of any significant cold to come for the week ahead. Beech, Fagus sylvatica, at Colesbourne Park. Argyanthemum 'Jamaica Primrose' is still flowering profusely, despite the generally dingy weather and the frost a month ago. It is one of the very best plants I grow. I've had a rather busy but interesting week, with meetings at Wisley on Monday afternoon and Tuesday (the annual specialist societies and RHS colloquium) and then at the RHS offices at Vincent Square for a meeting of the Gardens Committee. In between we have been active at Colesbourne, continuing the preparations for winter. My purchases from Kevock Garden Plants. On Wednesday evening we had the busiest ever meeting - at least in living memory - of the Oxford & District AGS Group, with almost 50 attendees present to hear Prof. David Rankin of Kevock Garden Plants give a fascinating talk about the plant introductions of George Forrest. Illustrated with pictures of plants both in the wild and in gardens, he discussed the plants Forrest brought in and the ones he missed, or didn't persist, and made ther point very clear that we must do our utmost to keep viable populations of plants going in cultivation whenever possible. It was a great talk and I can recommend him as a speaker. Perhaps what really attracted the crowd, however, was the opportunity to buy plants (and pick up pre-orders) from a very tempting selection he and his wife Stella had brought along from the nursery. 'Feeding frenzy' is a mild description of the activity around the stall. Another batch of goodies arrived in the post, in the form of a selection of succulents sent by Stephen Anderton. They'll make a nice addition to the display next summer. A nice day today has meant it's been possible to get outside and start the auitumn tidying in the garden here, and to enjoy the flowers left on many plants. Now we await the arrival of The Bishop on a pastoral visit, though spirits rather spirituality are more the order of the day. The curious dwarf Acer platanoides 'Marit' - always a conversation piece. Rudbeckia triloba 'Prairie Glow' - a new release from Jelitto seeds, with orange tints in the flowers. Nice, but late to flower, and the plants are a bit sparse: hopefully the biennials among the batch will make bigger, bushier plants next year. The Silver Sebrights arrive to invesitigate the activity in the gravel border: Chrysanthemum 'Mei kyo' in centre, and 100 Allium 'Purple Sensation' in the yellow net. With bright, warm sunshine throughout, yesterday was perfect for getting on in the garden. I took the opportunity to plant some big batches of bulbs in the gravel border - alliums and tulips mostly, and a few elsewhere, and then to give the lawn and meadow area their final cut for the year. The grass was rather wet and the meadow especially looks a bit mangled, but the likelihood of a better day to do it this year seemed slim and it will soon look fine. Chrysanthemum 'Action Bronze' - welcome rich colour in a broad dome. I was recently sent a copy of For Galanthophiles, a beautiful collection of ph﻿otographs of snowdrops by Josh Westrich with text by Clemens Heidger, gathered into a substantial book. As in the earlier book 'Helen Ballard, the Hellebore Queen' by Gisela Schmiemann, Josh Westrich's photographs are displayed on a white background and gain great vivacity from this. A selection was exhibited at the RHS Harvest Show last year and was curiously given only a Silver Medal, as they are the most striking images of snowdrops I have yet seen, and deserve recognition as such. The text, which is presented in columns in no less than four languages (German, English, French and Dutch) is idiosyncratic and personal; its statements should be treated with caution in places, and nomenclatural convention has gone astray. But this is not a book to obtain for the text - just enjoy the superb photography. Far more valuable as a long-term reference will be the content of the Daffodil, Snowdrop and Tulip Yearbook 2011, just published by the RHS. This is one of the most useful of annual publications, always packed with interesting articles on its three subject groups - though it's interesting to see how very much to the fore snowdrops have become in its pages. This issue contains a particularly important article by Matt Bishop, establishing the concept of the 'inverse poculiform' snowdrop - illustrated with his characteristic photographs of flowers against a black background, precision-poised to show off the vital features of each flower's markings, but losing nothing of their beauty thereby. I hear the cries, 'What is an 'inverse poculiform' snowdrop?' and why is it important? Poculiform snowdrops have been known since the Nineteenth Century, when the name 'Poculiformis' was coined for a form of Galanthus nivalis in which the flower was composed of six equal, all white segments, equating to a replacement of the normal inner segments by another set of outer segments. I posted about them in March 2010. 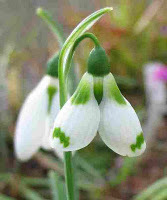 In recent decades, starting with the famous G. plicatus 'Trym' a whole series of snowdrops - in several species and hybrids - have arisen in which the flowers are composed of six equal segments showing green marks and often an apical notch: in this case the outer segments are effectively replaced by a whorl of inner segments. This inversion of the traditional poculiform flower form has never been recognised by a formal name, until now: the concept of an 'inverse poculiform' will enable us to communicate much more effectively about these often very charming plants. the outer whorl of segments is marked exactly like the inner whorl. For galanthophiles, the 'Daff Yearbook' (as it is often called) also contains a piece by Hanneke van Dijk on her classification scheme for snowdrops, a review of her book Galanthomania by Alan Leslie, Joze Bavcon on Slovenian snowdrops and a nice article by John Blanchard on Leucojum and Acis, as well as reports on plants exhibited at shows around Britain in 2010-11. Daffodil matters are well covered too, ranging from considerations of the wild species and miniature hybrids to the latest exhibition bloms, including the remarkably greenish 'Mesa Verde' illustrated on the cover. The Daffodil, Snowdrop and Tulip Yearbook is an important annual work, published at a loss by the RHS and therefore constantly under threat (its parent Daffodil and Tulip Committee is indeed being terminated in the near future, though it will be resurrected in a new guise). It deserves support and I urge anyone interested in any of (though I hope it will be all) the three genera concerned to buy a copy - at a cover price of £11.95 it is excellent value. Hydrangea macrophylla 'Pfau' - a well-named peacock of a plant. On Saturday I gave a talk for the Lakeland Horticultural Society in Windermere, which provided the opportunity to see their gardens at Holehird. This is a remarkable place, with 17 acres of garden surrounding the former estate mansion (now a Cheshire Home), entirely curated and worked by volunteers of the society: there are no paid positions. The site is nicely varied in terrain, with what should be spectacular views across Windermere to the mountains beyond, and has great diversity in its plantings. Three National Plant Collections are held there: Astilbe, Hydrangea and Polystichum, all seeming to be well maintained and labelled.. Though none is at its prime at the end of October, the standing stems of the astilbes were rather attractive, and many of the hydrangeas were showing pleasant tints in their senescent flower heads - in fact 'Pfau' (picture above) was really very spectacular at this stage. Holehird Gardens in the rain. Unfortunately it started to rain as we arrived in the Lake District and it just got heavier through the day, so although it didn't stop me carefully going round the garden, it wasn't showing its best face. Even so, the autumn colours were looking good and I very much want to see it at another time of year. On Saturday evening we stayed with our friends Michael Person and Eric Culley at Austwick Hall, their beautiful boutique hotel in the Yorkshire Dales, and had a wonderfully pleasant evening of comfort, great food and excellent company. One really can't recommend it too highly. In the morning we took a tour of the ever-changing garden, where the borders are to undergo a major makeover this winter, and through the wood above the house where a trail leads to a series of carefully chosen and aptly sited contemporary sculptures. The woodland is also planted with snowdrops and the garden is open in season for visitors to enjoy these - dates are on their website, as well as at other times during the year. Crozier sculpture in the Austwick sculpture walk. The Italian Garden at Trentham, designed by Tom Stuart-Smith on Sir Charles Barry's plan. Returning southwards on the M6 and frustrated by the crawling traffic, tempting signs led us to make the snap decision to visit the gardens at Trentham. Once the property of the Dukes of Sutherland, the estate was acquired in 1996 by St Modwen Properties Plc, who have unashamedly turned it to profitable purpose. Only being familiar with images of the garden, we were not prepared for the vast carpark and behorded retail village through which one passes, but once over the bridge into the garden that all seems very far off. The gardens were laid out in the Eighteenth and Nineteenth centuries to accompany successive incaranations of the great house, Trentham Hall: first (1759-1780) with a 'Capability' Brown landscape of lake and wooded vistas, which remains magnificent, and the formal Italian gardens adjacent to the house, created by Sir Charles Barry in the 1830-40s. The house fell into disuse and was demolished in 1911, but the landscape survived and has been magnificently, and justly famously, restored by St Modwen. The centre piece remains the vast Italian garden, whose parterre beds have been filled with grasses and perennials in the modern style by Tom Stuart-Smith, but adjacent to it are areas designed by Piet Oudolf (the 'Floral Labyrinth' and 'Rivers of Grass'), a Victorian trellis walk, and areas of lawns and trees. We arrived with just half-an-hour off sunlight left, in the unpleasantly and suddenly shortened winter afternoon, but the low sun showed the plantings at their most beautiful and radiant - a really lovely sight. It was interesting to compare the styles of the two designers: Oudolf's big bold blocks, and the subtle diversity of Stuart-Smith's plantings, so skilfully worked into a true parterre with formal box edging. Once again, this is a place to return to and really explore and study. Artichoke heads embedded in grasses. Miscanthus plumes catching the last of the sunshine. Piet Oudolf's Labyrinth of Flowers.